The Earth is a closed system. For our examples, we need to think that nothing comes in (except energy) and nothing goes out (except energy). Even the amount of energy that moves in and out of the Earth is equal. If more came in than was released, we would heat up. If the Earth gave off more energy than it received, we would cool down. The smarties in the crowd are saying "What about meteorites?" Yes. There are small amounts of matter hitting the Earth from space. On the other hand, we are sending more satellites and spacecraft into orbit. A little is being lost too. The big point of this section is to look at the idea that humans have a finite amount of material on this planet. We call these materials natural resources. Not only are humans using these materials, but nature is using them too. The difference between humans and nature is that nature doesn't waste. Materials are cycled through the ecosystems of the Earth and reused whenever possible. There have been points in time where nature runs out of things and it adjusts, changing ecosystems or the types of organisms that survive. Think about water for a second. Many places used to have large freshwater lakes with thriving communities. Over thousands of years, those lakes dried up and some even became deserts. Nature didn't just give up, with the change in environment, new organisms began to thrive and the ecosystem changed. Humans may be doing that as we speak. 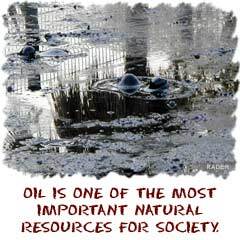 We use natural resources, but don't return them to the system. They may wind up in landfills or at the bottom of the ocean. If we have a finite amount of resources, there is always the possibility that we will run out. Nature will continue. The organisms that survive will change. But we might not be one of them. Don't worry about it this afternoon. We have plenty of stuff for a long time. Forests are an easy starting point. These are dense ecosystems with a large amount of plant life. Types include tropical and temperate forests. Some have a lot of rain and others have seasonal moisture. Humans like the land and the trees. Realtors say location-location-location when they talk about homes. They know that there is only a specific amount of space in an area that people can live. Unfortunately for forests, they are sometimes sacrificed for our needs. We like the timber. We build houses and all sorts of stuff from wood. The big worry of many people is not timber, it's the fact that many forests are being cut down to increase the amount of farmland. What happens when you lose forests? Well, there's less timber. There's also a complete change in the ecosystem. Forests absorb heat and cool areas. They also release oxygen into the atmosphere and help purify the air. When you clear-cut a forest the temperatures can increase, wind patterns can change, and (many would argue) it's less beautiful. But there's always a trade-off. We need more food. More farmland=more food. As with all of our discussions of natural resources, management of the resources is the key to success. Are they just big hunks of rock? No way. Mining operations see mountains as the source of their ore. They might be looking for iron, silver, gold, diamonds. whatever. All mining requires a hole in the mountain, blowing up part of the mountain, or maybe making a deep hole in the ground. We use the mountain loosely. Think of it as the surface of the Earth. As with forests, there are only so many areas with easy mining opportunities. If humans use up all of those locations, the cost of getting those resources will go up. 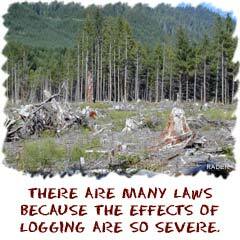 There's also the problem of destroying the surrounding area. Not only do some mining operations leave big holes in the Earth, but also the process of mining often collects toxic materials in the rocks. Those pollutants are left over and poison the surrounding area. There are ways to use these resources, but intelligent management is the key. Oceans, water, puddles. All areas with water are natural resources. The most direct connection to you is drinking water. Aquifers exist under the surface and wells pull that freshwater out for you. If humans take out more water than goes in, they will run out of water. An even worse situation would happen if the water were accidentally poisoned (maybe mining or farming). If you look at all of the water on Earth, there isn't a lot of freshwater. That's what makes it so important. Saltwater provides other things we need including food. Fishing is a huge industry that needs to be managed so we don't over fish the oceans. If we do, there won't be enough fish left for the world. We'll say management again, but you need to understand there aren't easy answers. You might think of competition as a baseball game or maybe two wolves fighting over a piece of meat. The real competition of your future will come from people competing for natural resources. There will always be at least three groups involved. You will hear about business and companies that want to take as many natural resources as they can in order to have a more successful business. Many of them will not be thinking long term, especially in developing nations. You will also hear about environmental extremists who want to keep the Earth exactly as it is. They might want to lock out all industry from using any more natural resources. They often think that because they are willing to sacrifice certain pleasures in life, everyone should. And then there will be those in the middle. People who think long-term and want to preserve the environment but know that business will need some of the resources. The environmental managers will plan for plans such as reforestation and fisheries to replenish the oceans. There will be no easy answers. Just know that when it comes to natural resources you need to think long-term. The Earth and nature will adjust. It's the people that might not be happy with the results.